Want To Be The Next Redhead Model? Do you want to be like these girls? Do you want to see your face all over billboards, ads and in-store collaterals? 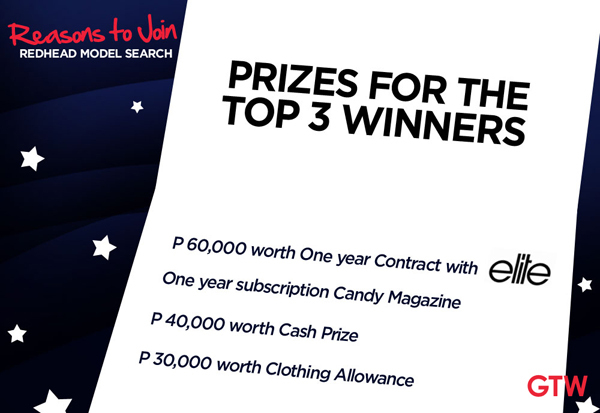 Join the Redhead Model Search and get a chance to become one of their 3 new models! SM Girls Teens’ Wear is now looking for the next batch of Redhead Models this 2012. The search is open for girls aged 15 to 25 years old, single and at least 5’1” in height. Do you think you have what it takes to be the next Redhead Model? From July 13 to September 6, simply purchase a minimum amount of P399.75 worth of any regularly priced item/s of the brand Redhead found at the Girls Teen’s Wear section of all SM Department stores nationwide. Each P399.75 and up single receipt corresponds to a unique registration code which can be redeemed at booths found inside the Girls Teen’s Wear section, along with an application form. Fill it up and make sure to submit it along with your full body photo and close-up head shot. If you can’t submit your form and photos at the designated booths, you can also submit them online at SM GTW’s website and Facebook page. 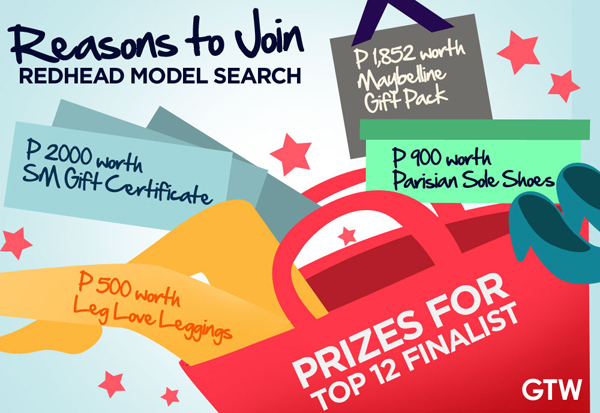 Another way to join is to drop by the Redhead Model Search Mall Tour. The schedule and venues for the tour are stated in the poster above. Remember, last day for submission of all application forms is on September 6, 2012. 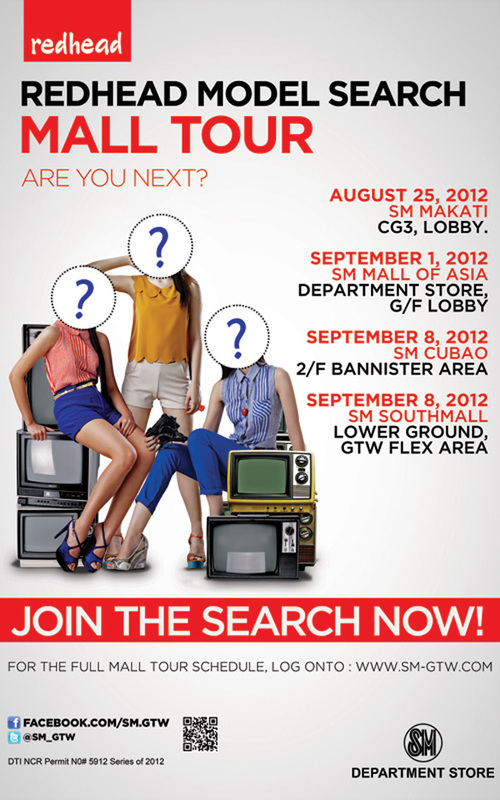 Announcement of the Top 12 finalists will be made on-line via SM GTW’s website and Facebook page by September 14. The Top 12 girls will undergo training modules on make-up, styling and modeling. They will also get to win these amazing prizes from Leg Love Leggings, Maybelline, SM and Parisian. Out of the 12, 3 winners will be chosen to become the next Redhead models. Public voting for this will be open from September 14 until September 27. The 3 Redhead winners will be announced and presented to the public during the Candy Magazine Annual Fair on September 29, 2012. They’ll be walking the runway with me and other SM GTW brand ambassadors too! Aside from this, check out the fabulous prizes that await the 3 winners below! So what are you waiting for? Grab this once in a lifetime opportunity! Join now and you might be part of the next batch of Redhead Models. For more details, log on to sm-gtw.com or like them on Facebook. For inquiries or updates, you can also follow SM GTW on Twitter. Ate Camille kailan po yung next search? Hi Ate Camille!!! Uhm, 12 years old po ako.. Pero 5’4 po height ko.. Can I join?? They’re already stated here but you may also visit the GTW website or Facebook page if you want. :) All links are already in this post :) Good luck! Go for it! :) Don’t waste this opportunity! Ouch! Im not sure if I”m 5’1. Hindi ko nga alam kung na reach ko yung height na yun. Can I still join? Will they allow me? Hi miss if I am 14 but I will be 15 this December can I still join? Hey Camille! I would just like to ask if i’m 14 now but I will be 15 this November will I still be able to join the Search? I’m not too sure :( Sorry! Hi ms. Camille ! Are you gonna be one of the judges in this search? :) just askin. I also want o join but im small and skinny hayzzzz. Thanks! Hi ! My cousin would love to send in an application, but she’s only 12 turning 13 soon. She’s very tall, though. Atleast 5’2 already. She’s very beautiful, and is mature for her age. She’s olive white and she has potental, if I do say so myself. Is it STRICTLY 15 – 25 ? hi miss camille can i still join it even i have scars on my legs?? Camille, skinny girls can still enter modelling right? if ever i’ll be enetering modelling agency. My pleasure! :) Good luck! For the ones who will join, do they have to attend all the tours? Ohhhh ok =))) Thank you! I would really try to join this!! Thank you, Miss Camille for posting this!! I’m one step away from my dream!! Hi Camille! I would just like to ask if you could recommend any salon that has really good reviews for their haircut near QC Area (Tomas Morato, Timog, GH area, etc)? Hi Camille! I’m interested to join! What kind of photo should I submit and can I just send it on their FB page instead of going on the Mall tours? Should I purchased first a minimum amount of P399.75 before I can join? Is it required? Please help me! Thanks.